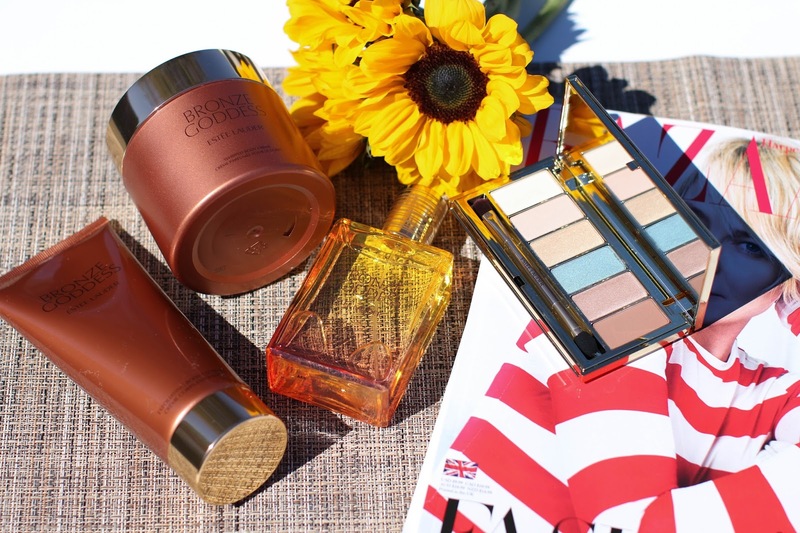 Every year Estee Lauder launches a summer Bronze Goddess collection and it's become one of the collections that I really look forward to. 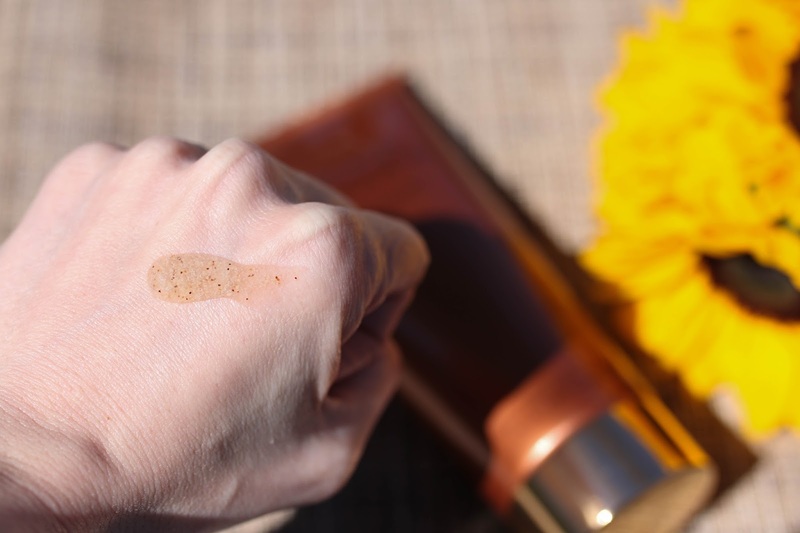 (see past year's reviews here) There are usually color and body products launched - I have typically reviewed the color items before, but this year I wanted to experience the body products (and the eye palette because I cannot resist a gorgeous neutral palette). 1. 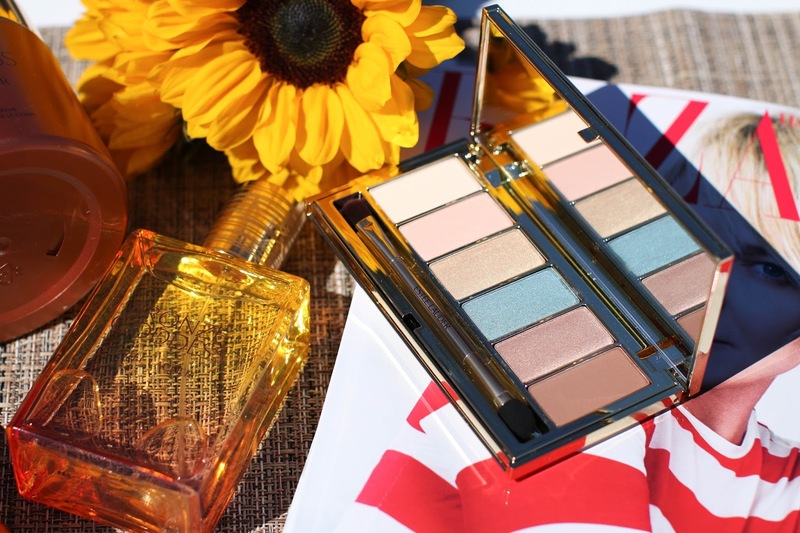 Bronze Goddess Eyeshadow Palette - Many summer collections experiment with vibrant color which in fun in theory, but not something I would wear regularly. However, this palette had a great option of neutral shades, but the bold/wild card shade was actually much more wearable than I am used to. The teal had a silver/taupe undertone so I can see this being worn on the lid alone with a bronzed cheek and peachy gloss, or as a liner underneath the eyes for a hint of color. The formula is a medium pigmentation but takes a bit of work to get it to the payoff I show above. 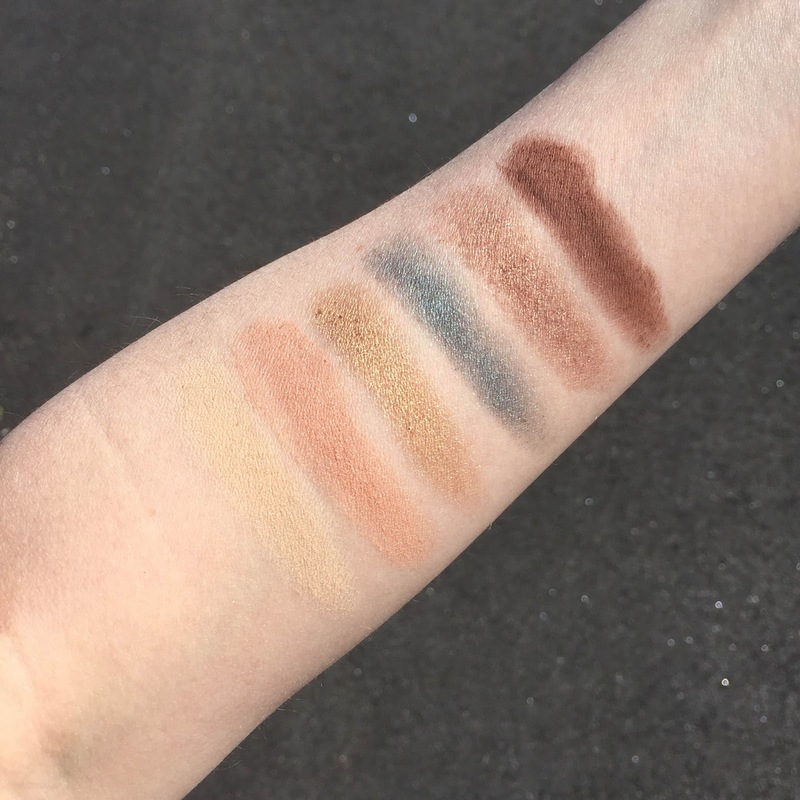 The last two shades were the most pigmented with only one swatch needed to get that richness, however the other 4 shades required 2-3 swipes to reach this desired intensity. Yet, oddly enough when I used these on the eyes, I found that each color was much easier to apply and build up color. I am not quite sure why that happens with some palettes I review - swatches with my fingers will require more effort than using a brush on my lid. Either way, this is a stunning palette for summer with a nice range of shades. 2. 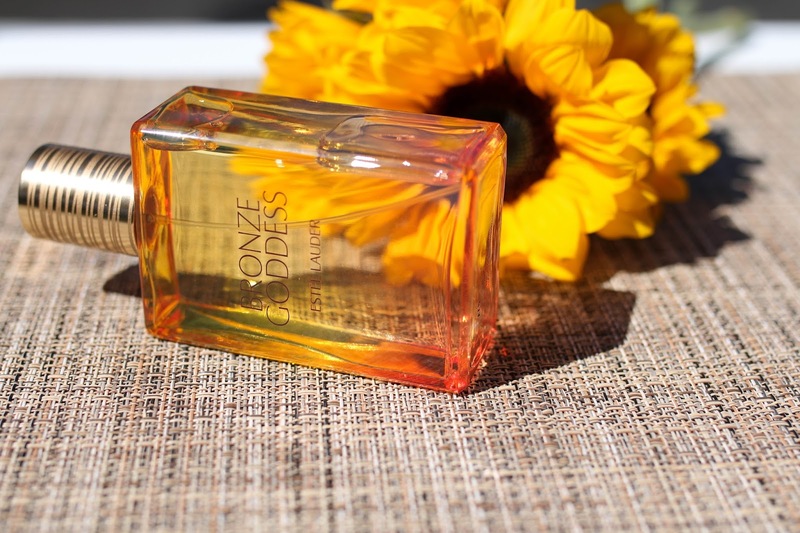 Bronze Goddess Skin Scent - Ok - real talk. The packaging was the first thing to lure me in with this fragrance, as the scent wasn't something I typically wear. It smells like a mixture of coconut and suntan lotion - though much more elevated and refined. I couldn't decide if I wanted to smell like that - until I sprayed it on my skin. After two hours of running errands and walking around, I was leaning down to smell my wrist every few minutes! LOL I fell in love with how it wore, and frankly it put me in the best mood that day. Perhaps it was the reference to summer that a scent like this conjures up, but all I knew is I couldn't get enough. Since it is a body mist rather than an EDP, I anticipated the scent dissipating quickly, but was pleasantly surprised when it lasted most of the day. Not in an way that overpowers those around you, but in a way that develops nicely the longer I wear it. 3. 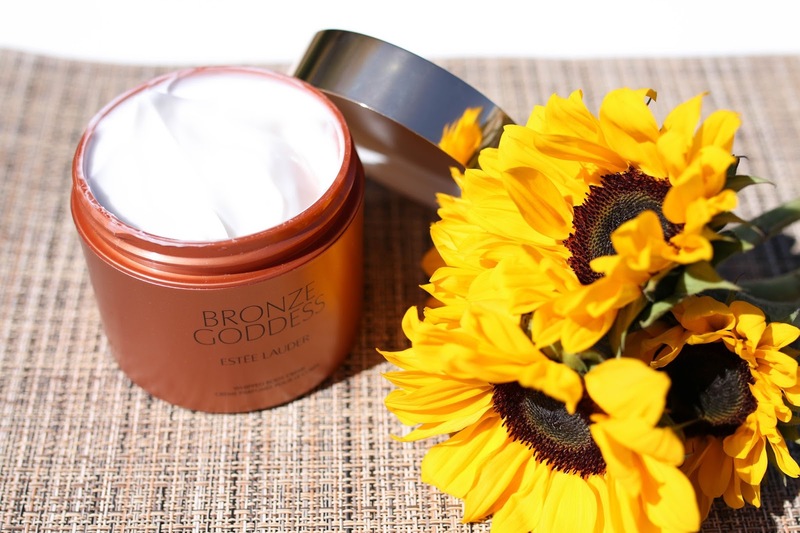 Bronze Goddess Whipped Body Creme - If a mist is not your thing, the body cream is a great option. It still contains the Bronze Goddess scent, but is more subtle. From the picture, this cream looks like the thickest body cream imaginable. However, when I dipped my finger into the tub, it had more of a whipped texture that felt like a cooling gel on the skin rather than a stifling heavy cream. Since there have been a few days here that allowed me to break out my bare legs, I have been enjoying rubbing this into my lower legs as a finish to my getting ready routine. It makes my skin feel smooth and fresh, with just a hint of that coconut and amber coming out in the fragrance. I had to check the calendar because I thought it's summer already, your photo is truly gorgeous! I love any body lotion/cream with cooling sensation, this one sounds really refreshing. Those shadows are just so stunning, I love the pop of colour in the blue! I love the Bronze Goddess scent but I've never purchased it. That palette is so tempting too!